A time stop is when we purposely exit a position after a period of time because the price is not moving in our favor. Time stops are mostly necessary in reversals, meaning when we want to go long when price visits a support or short when price visits a resistance. When price is near or at a support zone where buyers should by definition be more aggressive than sellers we expect a rising in price. If this rise doesn’t happen within a certain time period then in many cases we should be better off if we exited the trade. Where are the buyers that are supposed to raise the price? Something must have neutralized them or maybe we made a wrong estimation of the support strength (buyers’ aggressiveness). The same argument is true for resistance zones at which sellers should have the upper hand and we expect a decline in the price of the asset. Of course there should be trades where it needs time for an asset to rise from a support or fall from a resistance but delay to do so is not a good sign in the first place (excluding imminent important news which cause consolidation in which case we shouldn’t open a position before the announcement). We must have the right combination of patience and willingness to exit the position if it hasn’t move in our favor within a certain time period. 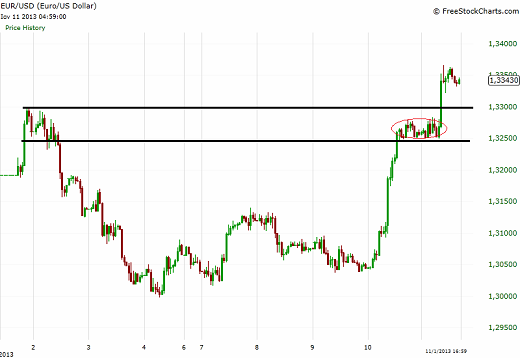 Below we can see the hourly chart of EUR/USD. We notice a very sharp rising in price from 1.30500 to 1.32500 where there is a resistance zone (between the two black lines). Many times when price is visiting a resistance after a steep advance it tends to correct downwards before continuing higher (reversal). This didn’t happen in the EUR/USD chart. If you had entered a short trade near or at 1.32500 then after an extensive period of consolidation (red circled area), you had better exit the trade using time stops. Where are the sellers who supposedly make the price decline? This is not a good sign for those who have taken short positions although you can never be sure about the direction of the price.